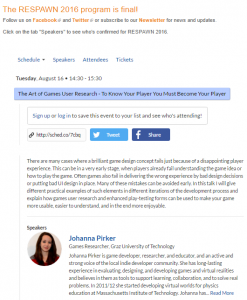 Find me on Aug 16, 14:30 – 15:30 at the RESPAWN 2016 giving a talk on Games User Research. There are many cases where a brilliant game design concept fails just because of a disappointing player experience. This can be in a very early stage, when players already fail understanding the game idea or how to play the game. Often games also fail in delivering the wrong experience by bad design decisions or putting bad UI design in place. Many of these mistakes can be avoided early. In this talk I will give different practical examples of such elements in different iterations of the development process and explain how games user research and enhanced play-testing forms can be used to make your game more usable, easier to understand, and in the end more enjoyable.